In these 3 hours you will be working at the jewellers bench with professional guidance from award winning jeweller Charlotte Yeo. 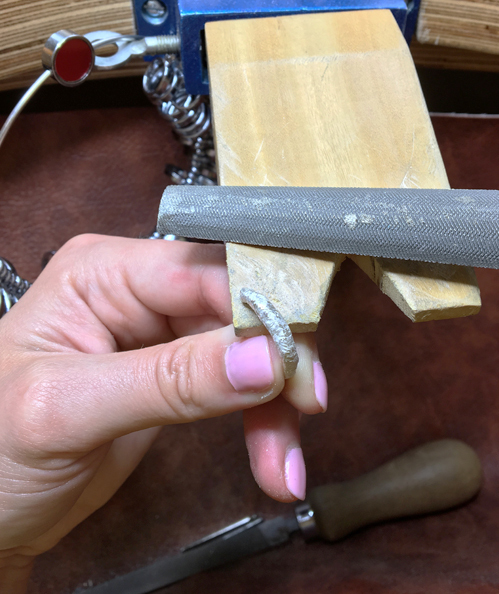 Learning and advancing your metal working skills by cleaning up your piece of jewellery to its desired finish and getting it ready to wear. *However to book this workshop you will need a piece of metal jewellery that you’ve made but that needs finishing. If you do not have this it is recommended to take this workshop in conjunction with the Beginners Wax Carving workshop, where you get a 10% discount, using code – beginners – at checkout. After you have purchased a workshop you will receive an email to confirm your place, which will include details about the workshop, directions to the venue and any other information you will need. Please state in “notes” during checkout if a workshop is purchased as a gift, including that persons name and your address, we will then send a ‘Voucher’ including all the details about the workshop.